The BBC said Friday that Somali pirates called the broadcaster to demand $7 million for the release of a British couple whose yacht was hijacked off the coast of Africa. The British broadcaster cited an unidentified caller as saying the size of the ransom was justified because NATO forces in the area had arrested Somali fishermen and destroyed their equipment. 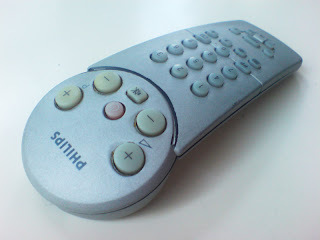 "If they do not harm us, we will not harm them," the BBC quoted the caller as saying. "We only need a little amount of $7 million." Paul and Rachel Chandler were headed to Tanzania in their boat, the Lynn Rival, when a distress signal was sent Oct. 23. The British navy found their empty yacht on Thursday, and both have been in sporadic contact with the British media since. The pirates will settle for $1.5 million and a share of the movie and book rights . . .
Paul Chandler told Britain's ITV News in a phone call that he and his wife were being held aboard a container ship anchored a mile from the Somali coast. They apparently had been briefly taken ashore. Chandler told ITV the pirates crept aboard his yacht at night while he was asleep. "They kept asking for money and took everything of value on the boat," Chandler, 59, said in the interview before the phone connection was abruptly broken off. The British navy found the yacht — empty — in international waters earlier Thursday. Warships had been searching for the Lynn Rival since it sent out a distress signal Oct. 23. Chandler later told the BBC in a telephone interview that he is being treated well by his captors. "We are well, and being looked after OK," Chandler said. "Food is OK."
Piracy in Harardhere started in 2003-2004 as the business idea of one man, whose foot soldiers took the British yachting couple last week: Mohamed Abdi "Afweyne" (Somali for "big mouth"). "He had no clue about the sea... On technical matters related to boats, I had to teach him from scratch and the first times we went out to sea, he was sick all the time," one of his associates recalled. Afweyne comes from an area and clan with no experience of piracy, but he head-hunted some of the most prominent pirates from the northern breakaway region of Puntland for his start-up. "Harardhere provided the perfect base for the pirates as it was far away from the fractions in the Somali civil war," Norwegian researcher Stig Jarle Hansen explained in a recent report on piracy. Early this morning a Thailand flagged fishing vessel (Thai Union 3) was under attack by two skiffs in the Position about 200 nautical miles north of the Seychelles and 650 miles off the Somali coast. The European Union Naval Force (EU NAVFOR) Maritime Patrol Aircraft based in the Seychelles was tasked for further investigations. At 5.30 UTC the EU NAVFOR Maritime Patrol Aircraft made visual contact with the fishing vessel and confirmed that pirates were on board. Skiffs used by pirates have been sighted onboard the fishing vessel. EU NAVFOR will continue to monitor the vessel that now appears to be heading towards the Somali coast. Adding this fishing vessel to the total number, this makes 8 ships in total held by criminals at the Somali Coastline. Thain Union 3 is part of a tuna fishing fleet owned by a Thai company whose brands include Chicken of the Sea. See here. I said "You must know the answer"
She said "No, but I'll give it a try"
Free speech is free speech. Even if it's speech you disagree with. But you don't have to listen if you don't want to. 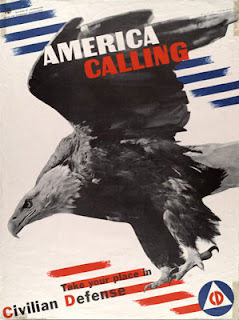 That's freedom, too. 2. Japan may sending refueling force to assist anti-piracy efforts off Somalia. 3. Economic effects of Somali piracy. Insurance, protection and contraction of trade - adds up to more than you think. 4. Impossible task of defending the seas from pirates. It's all about the failed state of Somalia. See also here. 5. Report of hijacked British yacht being spotted by EU force helicopter. UPDATE: Pirates threaten Great Britain. That used to cause the lion to roar. 6. 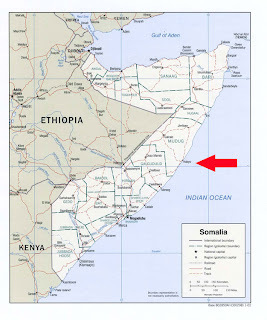 China battles Somali pirates? Article sounds very familiar to me. And here. 7. U.S. to send drones to fight pirates. But you already knew that. The INS Tabar, a warship sent last year to counter the pirates of Somalia, will be deployed. 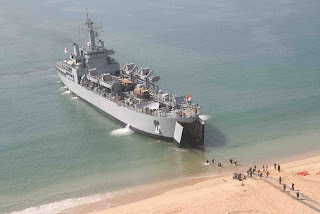 Joining the Tabar will be the INS Shardul, a fully armed amphibious ship which can carry more than 500 troops, and the ICGS Varuna, an offshore patrol vessel armed to the teeth. The Varuna can travel 4000 nautical miles at a stretch, enough to go around the world. Order of photos Shardul, Varuna, Tabar. 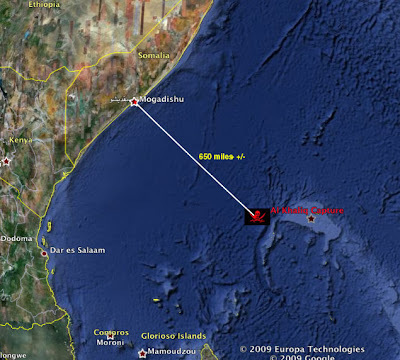 In the afternoon of October 27th 2009, 350 nautical miles east of Mogadishu, Somalia a French Fishing Vessel was attacked by pirates in two attack skiffs. The pirates opened fire on the Fishing Vessel. Her embarked military Vessel Protection Detachment (VPD) fired warning shots after which the pirates broke of their attack. The EU NAVFOR German warship FGS Karlsruhe, on anti-piracy patrol in the area, was ordered to set course to the attack position. Simultaneously, the helicopter of EU NAVFOR Spanish warship ESPS Canarias, also on anti-piracy patrol, was launched and relocated two fast attack skiffs trying to flee the area of the attack. The helicopter fired warning shots to stop both skiffs, after which the pirates stopped and were seen throwing items, presumably pirate paraphernalia, overboard. 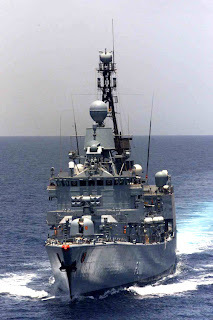 On arrival of FGS Karlsruhe her boarding team secured both skiffs, and found seven persons on board of the two skiffs. The French Fishing vessel was requested to return to the scene to identify their attackers. 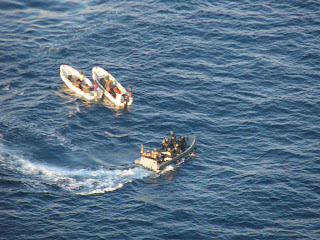 Upon their statements the seven suspected pirates were detained on board FGS Karlsruhe. Project Valour-IT: Join the Navy! Hey, this is a commercial. For something way bigger than me - something to help wounded Sailors, Marines, Soldiers and Airmen. It's just a request for donations to help provide our wounded with a means of communications - a way to join in the conversation through the use of laptop computers with programs that let them surf the web, send emails to loved ones . . . It was the first time I felt whole since I’d woken up wounded in Landstuhl. 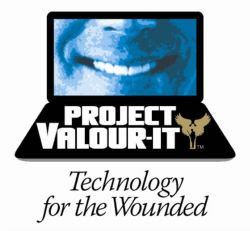 Every cent raised for Project Valour-IT goes directly to the purchase and shipment of laptops and other technology for severely wounded service members. As of October 2009, Valour-IT has distributed over 4100 laptops to severely wounded Soldiers, Sailors, Airmen and Marines across the country, and is now expanding its mission to include other technology that supports physical and psychological recovery. I would simply request that you mark your check as being for #TeamNavy. Got a blog? 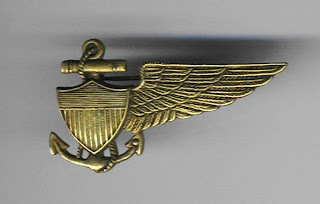 Join the Navy Team in this cause here. See also here. Fred Fry's Maritime Monday 185, featuring the ships of Malaysia’s MISC Berhard and enough nautical stuff to have you singing sea chanteys in your sleep. Salamander quietly disagrees with something here. And while I agree that a dedicated radar ship may be silly, dedicated radar blimps may be just the ticket! We need more one-winged pilots. Lex drops off a fledgling at Pensacola and find shadows of the past. Checks has a vision of unintended consequences. UPDATE: Ignorance. By the way, if you haven't read Grant's Personal Memoirs, you've missed a treat. 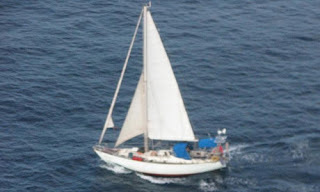 Somali pirates said on Tuesday they had seized a yacht in the Indian Ocean with a British couple aboard and were taking the vessel to the Horn of Africa nation. "The British couple are in our hands now. We captured them as they were touring in the Indian Ocean," a pirate called Hassan told Reuters. He said the two captives were healthy and ransom demands would follow. 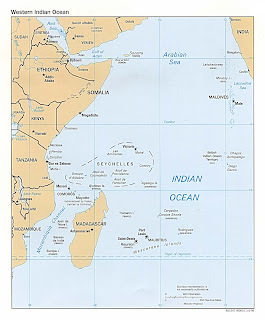 The Seychelles coastguard said it dispatched aircraft to search for the yacht after receiving a distress signal on Friday and now foreign naval ships and planes fighting piracy in the Indian Ocean had joined the search. "We have not traced the yacht yet," Lieutenant Colonel Michael Rosette, who is in charge of the Seychelles coastguard, told a news conference. "The yacht had only two passengers on board when it left the Seychelles." The Britons, Paul and Rachel Chandler, both in their fifties, left the Seychelles aboard their 38-foot yacht, Lynn Rival, on Oct. 22 and were believed to he sailing towards the east African coast. Andrew Mwangura, the East Africa Coordinator of Seafarers Assistance Program (SAP), said the British couple was in a high-risk area for hijackings off Somalia when their yacht, the Lynn Rival, sent a distress signal. 25/10/2009 13.19 UTC *Suspect Vessel Somali Basin (06 07.7S,045 10E) ---WARNING WARNING WARNING--- At 0845 UTC a suspect white plastic hull with 6 people on board has been detected in position 06 07.7S 045 10.0E It is recommended that all vessels not making scheduled calls to ports in Somalia, Kenya or Tanzania keep as far from the Somali coast as possible. MSCHOA now advise that vessels should consider maintaining a distance of more than 600 nautical miles from the coastline and when routing north/south consider keeping East of 60E Longitude until East of the Seychelles. All vessels transiting the area and not able to keep 600 nm off the Somali coast are advised not to approach closer than 100 nm from the position given in this report and maintain maximum CPA with any ship acting suspiciously. While navigating in the region vessels are urged to operate at a heightened state of readiness, maintaining strict 24 hour anti-piracy visual and radar watches, actively implement recommended anti-piracy measures and regularly report their position/course/speed to UKMTO. There is some indication the method of locating the "suspect vessel" was an unsuccessful attack on a ship transiting the area. From: Commander Task Force Seventy-Seven. To: Commander-in-Chief, United States Fleet. Subject: Preliminary Action Report of Engagements in Leyte Gulf and off Samar Island on 25 October, 1944. (a) My Operational Plan 13-44. (b) CTF 77 three part despatch 280015, 281002, and 280130, October, 1944. (A) CTF 77 despatches 210641, 240315, 240325, 241655, and 240543, October, 1944. 1. This report is submitted in amplification of reference (b) and contains such additional information as is presently available. It is submitted in advance of the formal report. To accomplish a ship to shore amphibious movement; to transport, land, and support elements of the Sixth Army in order to assist in the seizure, occupation, and development of the Leyte area of the Southern Philippines. 3. The Japanese reacted to these operations by sending major fleet units in a vigorous effort to repel or destroy our forces, resulting in the actions in Surigao Strait and the action off Samar, which together constitute the "Battle of Leyte Gulf". 6 OBB - Mississippi, West Virginia, Maryland, Tennessee, California, Pennsylvania. 5. Some discussion of conditions preliminary to the joining in action of major naval forces is deemed necessary in order that the action may be viewed in proper perspective. During the month of September, carrier-based aircraft of the Third Fleet had made extensive raids on main enemy airbases throughout the Philippine Islands, with the attacks concentrated on the group of airfields in the vicinity of Manila, San Fernando, and Laoag. These raids by the Third Fleet, under the command of Admiral Halsey, were most effective in destroying large numbers of enemy aircraft. Starting about 10 October, and continuing through about 20 October, Third Fleet carrier forces delivered destructive and extensive raids on enemy airbases and shipping in the Northern Luzon, Formosa, and LooChoo Island area. 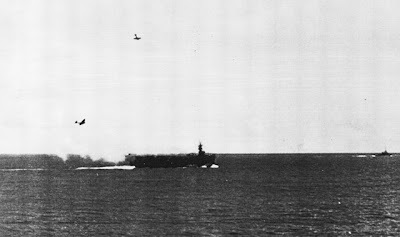 These Third Fleet raids, in addition to destroying large amounts of shipping, were effective in destroying large numbers of enemy aircraft and in drawing effective enemy aircraft strength away from the Philippine area and toward the Formosan area. 6. In the meantime, the Third and Seventh Amphibious Forces, covered by surface forces and carrier-based aircraft of the Seventh Fleet, moved north from New Guinea bases to effect a landing on the island of Leyte. The landing operations were initiated on the 17th October when the outpost islands of Suluan and Homonhon were seized by a light amphibious Group under the command of Rear Admiral Struble, supported by a part of the CVE's and by battleships, cruisers, and destroyers of Task Group 77.2. 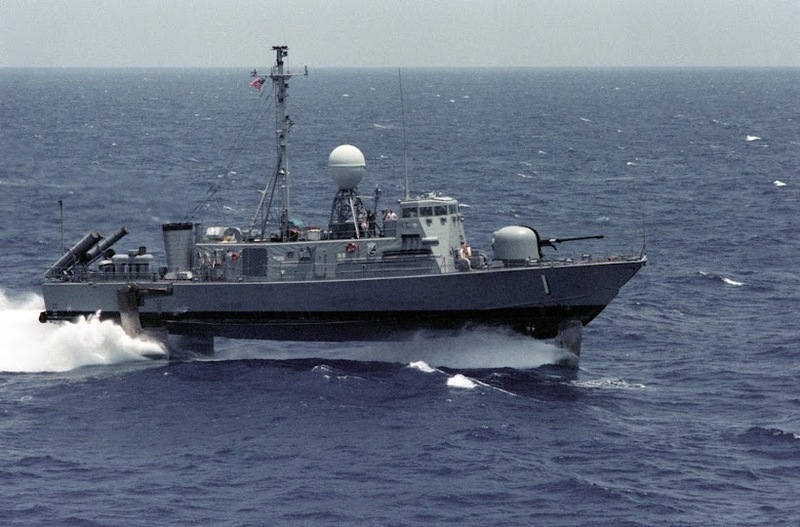 Minesweeping was commenced immediately to clear the mine barrier thought to exist between Dinagat Islard and Homonhon Island. The following day a landing was effected on Dinagat Island and the eastern entrance to Leyte Gulf was effectively secured. Minesweeping was continued and beach reconnaissance completed by underwater demolition teams by 19 October. 8. In order that early warning might be had of the approach of any hostile naval forces, submarines had been stationed to guard Brunei Bay, Balabac Strait, Mindoro Strait, Verae Island Passage and to the westward of Luaon off Manila and northward thereof. 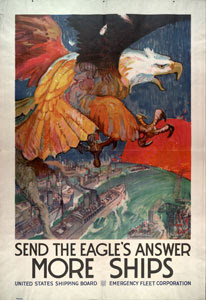 Air searches from Korotai Island, extending from Balabac Strait to Verde Island Passage were extended to a radius of 1000 miles, while carrier Task Forces of the Third Fleet and air searches by Central Pacific forces from Palau and Saipan were depended upon to give early information of the approach of enemy forces east of the Philippines. 9. At 0200 I/23 a submarine reported a radar contact on three battleships southwestward of Palawan Island on position latitude 08-20N, longitude 116-20E, course 040 degrees, speed 15 knots. At 0300I/23 a submarine reported a force of 11 combat ships in position latitude 08-47N, longitude 116-37E on course 039, at speed of 15 knots. At 0340I/23 the submarine Bream reported a force of at least two heavy cruisers and several destroyers in position latitude 14-05N, longitude 119-43E, speed 10 knots and on a course directed for the Verde Island Passage, and reported one hit in an Aoba Class heavy cruiser. At 0630I/23, the submarine Darter in position latitude 09-24N, longitude 117-11E, reported 3 battleships, 4 CA, and three other vessels, and also reported obtaining four torpedo hits in one Atago CA and damaging another Atago class CA. At 0700I/23, the submarine Dace, in position latitude 09-24N, longitude 117-20E, reported a total of 11 ships including 3 BB, 2 CA, one CV, and many unidentified CA, CL, DD, and reported getting four hits in a Kongo class BB. It was later determined that the attack of these two submarines resulted in the sinking of the heavy cruisers Atago and Maya, and the damaging of the heavy cruiser Takao. The U.S.S. Darter in the heat of pursuit subsequently grounded on Bombay shoal and had to be abandoned. 10. From the foregoing reports it was realized that large Japanese naval forces were on the move and it was estimated that the Northern force could arrive at Coron Bay about 2000I/23 and the large force moving Northeast through the Palawan Passage could arrive at Coron Bay about 0100I/24. It was believed that the Japanese might refuel in the vicinity of Coron Bay, and it was now felt fairly certain that they would attempt an attack on our naval forces off Leyte, probably through Southern Surigao Strait. At 2130I/23, the submarine Angler in position latitude 13-00N, longitude 119-30E reported 15 to 20 ships including three probable battleships on easterly course at a speed of 18 knots. 11. 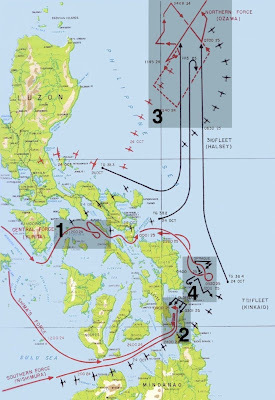 Presumably based on these excellent submarine reports, Commander Third Fleet directed three reinforced air searches to be mode by his fast carrier groups on the early morning of the 24th; one to cover thc Manila, Verde Island Passage, and Sibuyan Sea areas; one to cover Southern Visayas and Central Sulu Sea area. These searches here successful in locating large enemy forces, and at 0840I/24 an enemy force reported to consist of 4 BB, 8 CA, and 13 DD, was reported, just south of Mindoro Island, moving northeastward into the Tablas Strait. At 0904I/24, aircraft reported a force consisting of 2 BB, 1 CA, and 4 DD in position latitude 08-55N, longitude 121-50E, course northeast, speed 15 knots, and claimed four bomb hits in each of the battleships and rocket hits on the DDs. These two enemy forces will henceforth be referred to as the Central Force and the Southern Force. 12. The Southern Force was again reported by aircraft and attacked at 1000I/24 in approximately the same position and on the same course as before and at 1155I/24, a Korotai search plane in position latitude 09-30N, longitude 120-30E, reported 3 CA, 4 DD on course southeast, at speed 10 knots. The morning attacks on the enemy Southern Force had been delivered by the reinforced search group of aircraft of Task Group 38.4 which shortly after 1000I/24 stated it was moving north to effect concentration with the remainder of Task Force 38, northeast of San Bernardino Strait and would be out of range of the Southern Force. 13. As reported by Third Fleet aircraft, the enemy's Central Force continued to move northeastward through Tablas Strait and at 1200I/24 a total of 25-27 combatant ships of this force were reported north of Tablas Island moving on a general easterly course. 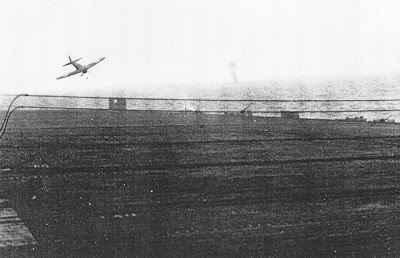 Aircraft from Task Force 38 struck at this enemy force between 1430 and 1500I in a position in the Sibuyan Sea about 30 miles north of Sibuyan Island. The force was reported to consist of a total of 4 BB, 8 to 9 CA, 2 CL, and 12 or 13 DD. Aircraft reports indicated that the enemy force had been severely damaged and was badly disorganized. Nevertheless, aircraft at 1925I/24, reported substantially this same force moving on a course of 120 degrees towards the northern tip of Masbate Island and again at 2030I/24 aircraft reported the same enemy force just north of Masbate Island on an easterly course evidently bound for San Bernardino Strait. 15. By early afternoon of the 24th, it was felt definitely that the enemy intended to attack our naval forces covering the landing on Leyte Island, and dispositions were made accordingly. Thirty PT boats in ten groups of three each were stationed as reconnaissance and attack groups as follows: three groups between Southeast Bohol and Camiguin Island, and Sipaca Point on Mindanao. The remainder covered the southern entrance to Surigao Strait and Jinatuan Passage, and the passage between Mindanao and Southern Dinagat Island, with orders to remain south of latitude 10-10N, and to report and attack enemy forces sighted. Task Group 77.2, under Rear Admiral Oldendorf, consisting of 6 OBB, 4 CA, 4 CL, and 24 DD, took up initial station in the latitude 10-34N, longitude 125-19E, in a position to guard both the southern and eastern entrances of Leyte Gulf with orders to attack and destroy any enemy forces attempting to enter the gulf. The carriers of Task Group 77.4 with their escorts were disposed about fifty miles to the eastward of Homonhon Island in three Task Units within mutually supporting distance and from north to south as follows: 77.4.3; 77.4.1; 77.4.2. 16. In addition to these forces, destroyer pickets were stationed in the southern and eastern entrances to Surigao Straits to give early warning of enemy approaches. A late afternoon air search to the westward in the Mindanao Sea to a distance of about 100 miles from the southern entrance of Surigao Strait failed to disclose the presence of enemy forces. Searches by night Catalina over the Mindanao Sea were not productive of reports of enemy sightings. Commander Task Group 73.7 (the Black Cats) was also ordered to conduct a night search to the northward of Leyte Gulf and eastward of Samar. Commander Task Group 77.4 was directed to run a search at daybreak for enemy surface ships to the northward covering sector 340 degrees to 030 degrees for distance of 135 miles, point of origin Suluan Island. 17. About 0030I/25 PT boats between Bohol and Camiguin sighted, reported, and delivered an attack against a fast approaching enemy force on a course for Surigao Strait. At 0123I/25 PT boats at the southern entrance to Surigao Straits reported strong enemy forces moving north at high speed in two groups. The first group consisting of 6 to 8 ships, including several heavy units and a second group about four miles astern of the first group and composed of about 8 ships. As the enemy moved north, PTs drove into the attack, but so far as can be determined, without effecting any material damage. Our Surface forces closed the enemy to form a semi-circle around the northern end of the strait--battleships in the center, cruisers and destroyers equally divided on each flank. 18. The action was opened at 0305I/25 by a destroyer torpedo attack, delivered by picket destroyer and torpedo attacks from both east and west against the enemy heavy ships by our destroyer attack groups. This was an excellently executed night torpedo attack by sections of three destroyers each. The torpedoes were seen to hit, the enemy column was slowed and many explosions noted. The destroyer attack was completed about 0400I/25 and at 0405I/25 our BB's and cruisers on easterly courses opened fire simultaneously at range of sixteen to seventeen thousand yards. BY 0445I/25 the remaining enemy had turned away and was in flight, hotly pursued by our surface forces. A few of his units were successful in escaping westward through southern Surigao Straits. 21. At 0653I/25 aircraft anti-submarine patrol of Task Unit 77.4.3 (Northern CVE Group) reported many enemy battleships, cruisers, and destroyers on a southerly course about 15 miles north and westward of the Task Unit. The first news of this enemy force was received on board the flagship about 0724I/24 when Commander Task Unit 77.4.3 reported that he was under gunfire attack by four battleships, eight CA and many destroyers, at a range of about 30,000 yards. This was the first indication that the enemy's Central Force had succeeded in passing through San Bernardino Straits. Up to this time, from information available to Commander Seventh Fleet, it was assumed that Third Fleet forces were guarding the San Bernardino Straits in position to intercept and destroy any enemy forces attempting to come through. To confirm this assumption, Commander Seventh Fleet had sent a despatch to the Commander Third Fleet asking if he was guarding the San Bernardino Straits. Reply was not received until after the enemy surface forces were attacking our Northern CVE Group. 22. At this point, the situation appeared very critical. 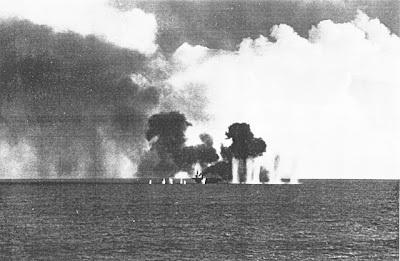 Our surface combatant forces were deep in the southern part of Surigao Strait, after the battle of the early morning, and after five days of almost continuous bombardment of shore objectives and fighting a naval action, they were exceedingly short of ammunition and fuel; moreover, the destroyers had expended almost all their torpedoes. Nevertheless, all of our available surface forces were ordered to concentrate at eastern entrance Leyte Gulf, preparatory to moving to the support of the retiring CVEs and an urgent call for assistance was sent to Commander Third Fleet. All aircraft were recalled from support missions and were directed against the enemy's Central Force attacking our CVEs. Task Units 77.4.1 and 77.4.2 moved northward to the support of Task Unit 77.4.3 and the enemy was hit with every conceivable form of plane attack, including dummy torpedo runs by planes without torpedoes. 23. At about 0730, in response to orders to cover a retirement of the northern carrier Task Unit, two destroyers - Hoel and Johnston - and the Roberts (DE) reversed and delivered a daylight half salvo torpedo attack against the enemy battleships at a range under 10,000 yards, then turned and delivered the other half salvo against enemy heavy cruisers at a range of about 7,000 yards. After one of the most gallant and heroic acts of the war, all three ships were sunk, although the Hoel continued to withstand concentrated enemy fire for about one hour before finally sinking. As a result of continuing air action by our CVEs and the destroyer attack, the enemy momentarily turned away, and several of his ships were seen to be hit and in trouble. 24. The enemy, however, resumed the action and about 0900I/25 the Gambier Bay was badly hit, dropped astern, and later blew up and sank as a result of enemy shell fire. The Saint Lo was sunk about 1050I/25 as a result of a suicide attack by an enemy dive bomber which crashed into the flight deck and started a tremendous fire. This fire caused several violent explosions on the ship and the Saint Lo sank without further enemy action. At 1255I/25, the enemy force turned away and commenced retirement towards San Bernardino Strait on a course of 015 and speeds of 15 to 20 knots leaving several damaged ships behind. 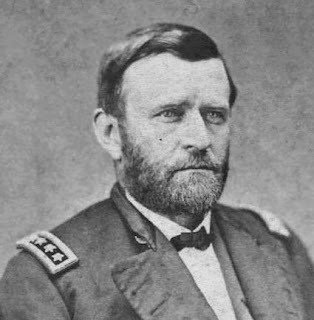 Throughout the morning and continuing into the afternoon, our CVEs were the primary target of incessant and strong enemy air attack. As a result of these attacks and of enemy surface gunfire, many of our CVEs were severely damaged and were unable to land or service their planes. In this extremity, the partially completed Tacloban airfield was put into use, and CVE planes were skillfully landed on that partially completed airfield, serviced, and returned to the attack, thus saving many planes and pilots who would otherwise have been lost due to water landings. It is remarkable, that in these landings on an unknown and ill-kept field, no serious injuries were sustained by our air personnel, which speaks very highly of their skill. 25. Planes of Task Group 38.1 arrived over the retreating enemy at about 1330I/25 and delivered their first attack about 1400I/25. As the enemy continued to retreat northward, they were continually attacked and harassed by the planes of 38.1 and by the planes of the CVE Force. The enemy's remaining forces consisting of about 14 ships, including his four battleships, were last reported entering San Bernardino Straits at 2200I/25, leaving several cripples far to the rear, which were finished off the next day by the forces of Task Force 38. Except for the pursuit phase, this ended the Battle of Leyte Gulf in which the enemy's major fleet was decisively defeated with heavy loss. 29. Starting with the early morning of the 26th and throughout that day, the 27th and 28th, the damaged and retreating enemy forces were subjected to the unremitting attacks of aircraft of the Third Fleet, aircraft from our own CVE's and searching aircraft of Task Force 73. Submarines moved to positions likely to be productive for attacking the crippled enemy forces. 30. Early on the morning of the 26th, one CL and five DD remaining of the enemy's southern force, were sighted by planes of Task Group 77.4 off Ormoc, on the western coast of Leyte. The attacking planes definitely sank one DD and heavily damaged the light cruiser. The remainder of this group of ships then moved northwestward and eventually joined the Japanese Central Force in the Sibuyan Sea. The damaged CA-XCVS Nogami was located off the northern tip of Cebu Island that same morning and was further damaged by planes of Task Group 77.4. The remaining one CL of the enemy's southern force fled westward through the Mindanao Sea, but was attacked and damaged by a Task Froce 73 search plane at 0200I/28 in latitude 05-35W, longitude 119-07E off the Northeast tip of Borneo. 31. On the early morning of the 26th, planes of Task Force 38 sank a damaged heavy cruiser (probably Myoko or Haguro ) east of Samar Island, while reports indicate other Third Fleet air attacks sank the Nasashi (BB), Kimano (CA) - both damaged by Third Fleet aircraft on the 24th - well to the westward in the Sibuyan Sea, and sank one CL, probably Yahagi or Noshiro, in the same area. On the afternoon of the 26th, Third Fleet aircraft finally caught and sank the damaged CA-XCVS Mogami off the east coast of Panay. Further damage was inflicted on surviving ships of the enemy's central force. The data in this paragraph is based on probably fragmentary and incomplete reports by Third Fleet Units as received aboard the flagship of Commander Seventh Fleet and is therefore admittedly incomplete and subject to wide correction by Commander Third Fleet. 32. Heavy and intense enemy air attacks were withstood by our forces in Leyte Gulf throughout the 26th without serious damage. 34. Our total plane losses during this period were 221. 130 of this total were lost due to sinking and damaging of CVE's during the battle of Leyte Gulf, 25 October, 1944. While precise data is not yet at hand, the great majority of pilots and air crews were saved. (c) In air combat 399 Total 554 37. 17 Oct. YMS 70 YMS Storm. 22 Oct. Sonoma AT Air bomb. 24 Oct. * Darter SS Grounded chasing enemy force. 25 Oct. * Gambier Bay CVE Gunfire. 25 Oct. * Saint Lo CVE Gunfire and plane suicide dive. 25 Oct. * Johnston DD Gunfire. 25 Oct. * Hoel DD Gunfire. 25 Oct. * Roberts DD Gunfire. 25 Oct. * PT 493 PT Gunfire. 17 Oct. Powell DE Storm. 18 Oct. Ross DD Mine. 20 Oct. Honolulu CL Air Torpedo. 20 Oct. Ashtabula AO Air bomb. 21 Oct. Tennessee (slight) BB Collision. 21 Oct. Australia CA Plane crashed on bridge. 21 Oct. LST 269 LST Shore mortar fire. 21 Oct. LST 483 LST Shore mortar fire. 22 Oct. Augustus Thomas Lib. Ship Air bomb. 25 Oct. * Sangamon CVE ) plane suicide dives. 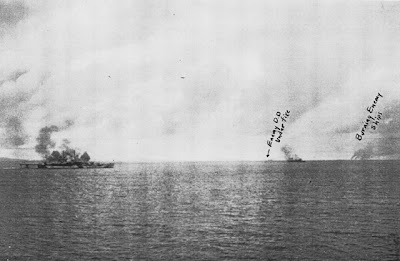 25 Oct. Hutchins DD Hit sunken LCI. 25 Oct. A. W. Grant DD Gunfire. 25 Oct . * Heerman DD Gunfire. 25 Oct. * Dennis DE Gunfire. 25 Oct. * PT 194 PT Gunfire. 26 Oct. PT 134 PT Airbomb. 27 Oct. Robert Wheeler AK Aircraft crashed on deck. 28 Oct. Denver CL Plane suicide dive. * Due to action in the Battle of Leyte Gulf, 25 October, 1944. There are four incidents to report in this period. 1. INDIAN OCEAN: Bulk Carrier (AL KHALIQ) hijacked 22 Oct 09 at 0555 UTC on 22 October 2009 while underway in position 04:09S - 052:35E. 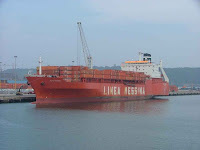 Two to three armed men boarded the vessel as it was carrying wheat cargo to Mombassa and took control of it along with its 26 crew members (24 Indian, 2 Burmese). The vessel is currently en route to the Somali coast (IMB, AFP). 2. INDIAN OCEAN: Bulk carrier (DE XIN HAI) hijacked 19 Oct 09 at 0815 UTC while underway in position 01:53S – 060:05E, approximately 325NM northeast of Port Victoria, Seychelles. Pirates boarded and hijacked the vessel while underway. There are 25 crew members onboard. Further information is pending (AP, IMB). 2. GULF OF ADEN: General cargo ship (THOR SPRING) fired upon 16 Oct 09 at 1405 UTC while underway in position 13:43.5N – 050:55.5E. One skiff with 5-6 armed men onboard chased and opened fire on the vessel. The master increased speed, conducted evasive maneuvers and headed towards a coalition warship. The vessel had rigged barbed wire along the railing and activated fire hoses. The skiff chased the vessel for approximately 40 minutes before aborting the attempt. The funnel, stern area, and accommodation were damaged due to the firing. No injuries to the crew were reported (LM: Times of Malta, IMB). As the summer monsoon season has come to an end, weather conditions continue to be conducive to small boat operations in the Indian Ocean off the east coast of Somalia, and in the Gulf of Aden. Mariners are warned to remain vigilant in their counter-piracy measures as an increase in aggressive small boat activity is expected in the coming weeks. Somali pirates currently hold fewer vessels for ransom than they have shown recent capacity to hold. This week, ONI assesses the risk of pirate attacks is high in the Indian Ocean with increased risks in the areas in vicinity of the Seychelles (Port Victoria: 04:37S – 055:27E) noted by the red circles on the image below. Please note pirates south of the equator in the Indian Ocean have recently demonstrated the ability to operate in the capability range of 20-30%. Prevailing currents are significant between latitudes 1 and 5 degrees south and tend to flow in an easterly direction with speeds up to 3.5 kts. 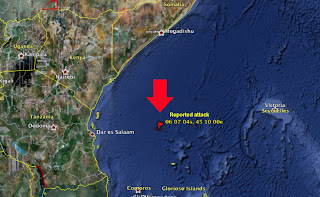 Therefore, increased risk of attack exists due east of the Somali coast out as far as 900NM between these latitudes. 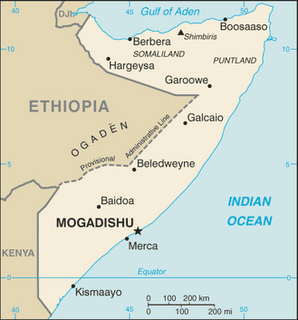 The Gulf of Aden remains a prime operating area for Somali pirates. 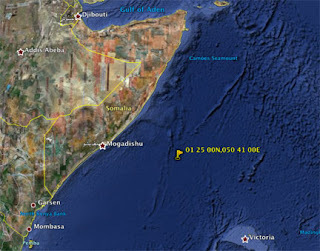 The Hijacked Bulk Carrier the DE XIN HAI is confirmed to have arrived off the coast of Somalia and is now in the vicinity of Hobyo. It is not yet known if the pirates have contacted the owners and made their demands known. 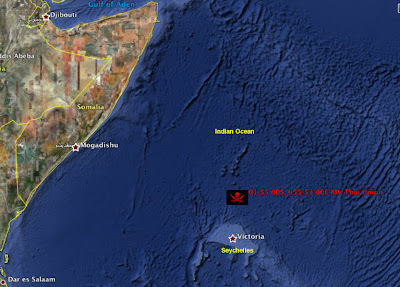 Red arrow points to Hobyo.
. . . MV Al Khaliq, a Panama flagged bulk carrier (180m and 22000 tons) reported being under attack 180 nautical miles west of the Seychelles. In the last contact with the vessel it was said that two pirates were on board trying to access the accommodation. On indication of the attack the second EU NAVFOR maritime patrol aircraft, operating from the Seychelles, was tasked to confirm the situation of the vessel and search for other pirate activity in the vicinity. 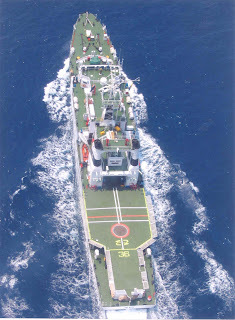 A ship of the Seychelles Coast Guard is also proceeding to the attack position. Within the last hour, the EU NAVFOR Maritime Patrol Aircraft has confirmed that “the hijack of MV Al Khaliq, 6 pirates on board and two attack skiffs in tow. The mother skiff has already been taken on board with a crane”. Al Khaliq photo from Hans Esveldt at ShipSpotting.com and used in accordance with ShipSpotting.com rules. 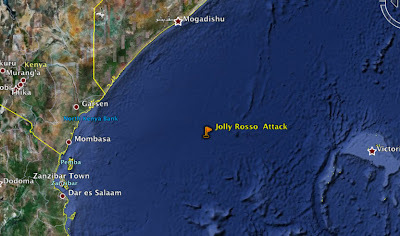 Italy merchant vessel, "Jolly Rosso", thwarted a pirate attack this morning 300 miles from Mombasa. On board the Italian ship, no one was injured and the only damage that was caused was due to machine gun fire from the aggressors. The pirates seem to be a group of four, with light weapons. The group targeted the merchant vessel from a skiff. The captain of the "Jolly" thwarted the attack by making several manoeuvres done normally under these circumstances and then by increasing the ship's speed. The Italian Navy has been informed of the incident. MV Jolly Rosso, an Italian flagged Ro-Ro Cargo ship (200m and 31000 tons) was attacked by two small skiffs. The pirates opened fire with automatic fire and also fired 3 Rocket Propelled grenades at the ship. The ship took appropriate evasive action, managed to evade the attack and is proceeding on her voyage. There were no casualties. 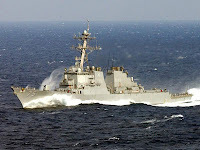 Belgium EU NAVFOR warship BNS Louise Marie was ordered immediately to close and neutralize the pirate attack position in cooperation with NATOs USS Donald Cook of CTF 508. An EU NAVFOR Maritime Patrol Aircraft based in Seychelles has also been tasked to investigate the area in support of both ships. UPDATE: See also here for more info on Al Khaliq incident. The ship is apparently Indian owned. 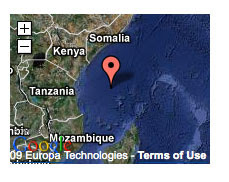 UPDATE2: CTF 508 is the NATO anti-pirate force operating off Somalia. Added photos of USS Cook (DDG-75) and Belgian firgate F931, BNS Louise-Marie. Somali Pirates: "China is coming and they're not happy"
China has vowed to rescue the crew of a coal-laden cargo ship seized by pirates far off the coast of Somalia, but a negotiated settlement is more likely, maritime experts said Wednesday. Off Somlia, currently China has a couple of frigates, a supply ship and some PLA marine commando teams aboard. The frigates carry a couple of helicopters. It remains to be seen how much they want the coal carrier back and what price they are willing to pay for it either in ransom or blood. 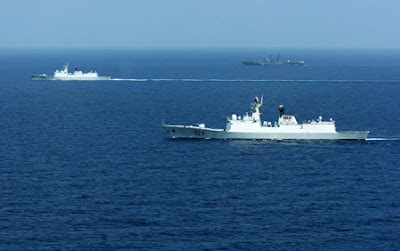 Reinforcements for the Chinese units are a long way away, unless they seek assistance from other anti-pirate patrol nations, some of which have been more aggressive in their use of force against pirates than others. There is also the question of whether or not a "big stick" approach will have any effect on future pirate operations against Chinese vessels. 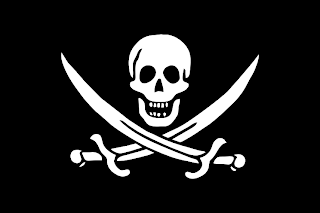 My belief is that the pirates don't really know who owns the ships they pursue, so I wouldn't hold much hope of deterring future attacks by a show of force. Unless, of course, that show of force means taking out the shore side operations of the pirates- which is not likely given the size of the Chinese force. China vowed Tuesday to make "all-out efforts" to rescue a Chinese cargo ship hijacked by armed Somali pirates in the Indian Ocean northeast of the Seychelles. "We will continue to follow developments closely and make all-out efforts to rescue the hijacked ship and personnel," foreign ministry spokesman Ma Zhaoxu told reporters, while giving no details of China's plans. China sent three navy ships to the Somali coast in January to join world efforts to protect shipping in the region from pirates and has previously come to the aid of some stricken vessels, Chinese state media reports have said. SOMALI pirates are threatening to execute seafarers on board hijacked Cosco Qingdao panamax De Xin Hai if any attempt is made to recover the vessel, according to a report carried on Radio Television Hong Kong. The station said it was quoting an associate of the captors, but did not give his name. The development comes after the Chinese authorities confirmed that an “all out” effort is to be mounted to take back the captured 2008-built, 76,432 dwt bulk carrier and its crew of 25. Some local military sources have suggested that the Chinese navy, which has assets in the Gulf of Aden, is already working on a rescue plan. UPDATE: Not surprisingly, the ship is headed for Somalia. Max speed 14.5 knots - which means the Chinese have less than 48 hours to interdict while it is in transit. Ship was reportedly enroute from South Africa to India when captured. Merchant ship photo from ShipSpotting.com copyright by "tropic maritime photos, Australia" and is used in accord with ShipSpotting rules. You Ain't Seen Pirates Yet? Somali Terrorists: World Cup Plot Against U.S.?